Mah-e-Mir, a story of a poet that showcases the struggle of a contemporary poet ‘Mir’ is out on screens today on Friday; the movie has been given Universal (U) ratings by the Central Board of Film Censor (CBFC). The film managed to earn Rs 278,000 during the last week. According to details, Mah-e-Mir earned more than 15 million rupees since its opening week. 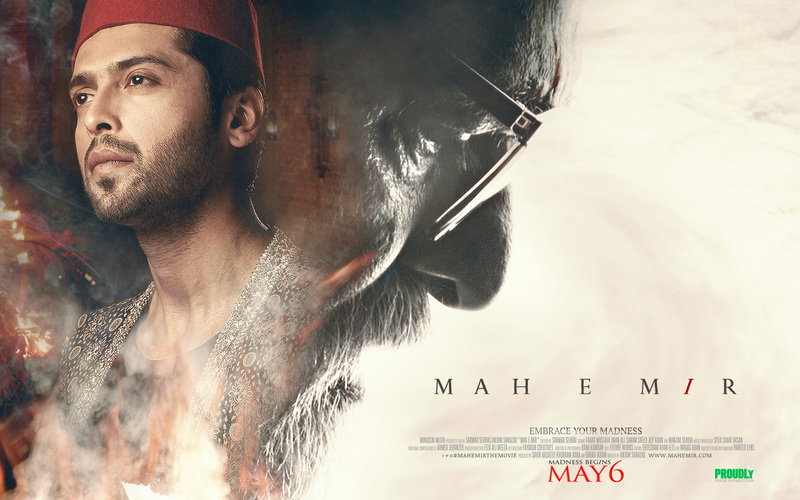 Revealing the box office details, Hum TV President Badar Ikram noted that the movie Mah-e-Mir has managed to earn Rs 16.8 million during seven days of its release. While talking to The Express Tribune, Ikram said that Mah-e-Mir is an art movie that caters to a particular audience. In regards to the genre of the movie, these figures are more than satisfactory. Mandviwalla Entertainment Managing Director also noted that the movie has managed to earn up to Rs 278,000 during the last week of its release whereas the average occupancy of the movie is 70 to 80%. According to unconfirmed reports, Mah-e-Mir Box Office Collection on the 1st day is almost 30 lacs in Lahore, 25 lacs in Karachi, 20 lacs in Islamabad, 8 lacs in Muree and 17 lacs in other territories of Pakistan. Meanwhile, the reports also state that the movie is likely to reap more at the Box Office on the second day of its release whereas the weekends are expected to roar with the highest Box Office Collection ranging up to 50 to 80 lacs. On the other hand, the film Mah-e-Mir has been granted Universal (U) rating from the CBFC on the first day of its release but the Anjum Shahzad directorial Mah-e-Mir had to make some cuts in regards to the Motion Picture Ordinance (1979) and Film Censorship Code (1980). Chairman Mobasher Hassan disclosed that the movie had some derogatory words and they had used a major political party flag in the background in one of their sequences that needed to be cut before the screening. Looking at such poetic historical debut, the film Mah-e-Mir is expected to earn well, especially for the people who possess poetic and theatrical interests. Not just fans but Pakistani celebrities are also looking forward towards Mah-e-Mir’s success. The film will attract all critics'I found the film awesome. #classic. anybody knowing Urdu would love it.